The Neag School of Education hosted more than 150 special education directors, special education advocates, service providers, attorneys, parents, teachers, and school administrators from across the state this past week for its second annual Special Education in Connecticut Summit. Although charter schools are intended to offer students better educational opportunities, they also pose a danger of making inequities worse than they were. That’s according to a new study by Preston Green, professor of education and law at the University of Connecticut, and Joseph Oluwole, associate professor of counseling and educational leadership at Montclair State University. New guidelines have been developed by Connecticut’s education department that describe the process parents should use for their children to be evaluated for special education services. But concerns are being raised that the new guidelines would make it harder for parents, not easier, than under previous guidance. After an extensive search, the Westport Public Schools announced the appointment of Anthony Buono as an Assistant Superintendent of Schools, commencing July 1. The Board of Education selected a new principal for Sage Park Middle School at a special meeting on Tuesday. Liana Jorgensen, the school’s current vice principal, will take over as principal in July for Paul Cavaliere, who is retiring at the end of the school year after 19 years in the job. Houston Independent School District trustees face a vote Tuesday on whether to move forward with plans to temporarily give up control over 10 low-performing campuses to a charter school operator, an unprecendented surrender designed to prevent school closures or a state takeover of HISD’s locally elected school board. 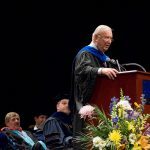 Ray Neag ’56, of Goshen, Conn., and Wyomissing, Penn., a philanthropist who built his fortune in the medical device industry, died Thursday, April 19, at age 86. He died at home with his wife, Carole, by his side.